Guess they wanted to make it easy for everyone to know exactly which political party is intent on subverting the govt & betraying our people. I got it and thanks for the tipoff. I think we should make Democrats and socialists all wear RED every day, Not white (a symbol of purity) but RED for the blood of aborted humans and blood of those murdered by illegals. When we see all of this RED every day we will be reminded of how much work we have to do. Na.. They all need to wear black and white stripped prison garb! 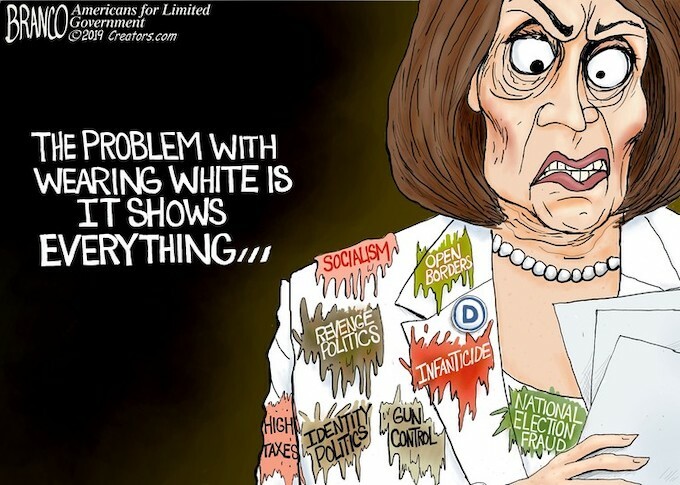 It appears the democraps have traded their white hoods for white pantsuits. Where are the investigative reporters that need to highlight how Marxists bought the 2018 elections that gave us this absurd, DemocRAT House of Representatives? SanFran(blood on her hands) Pelosi should “shut up and stand up” on WHY they want open borders – (hint) Cloward and Piven – to overwhelm our welfare state. They are still salivating over trying to find something on trump, to oust him. Given they are the party of the KKK, I think white is the PERFECT color for them. As the cartoonist said, all they need is the pointy hat to complete their outfits and show themselves for what they are!